What does it mean to be a prudent developer in to-day’s real estate market? Developers are far more prudent today than ever be-fore because we learned the lessons from the last recession. We borrowed too much then and when the market crashed, it was hard to pay back the loans. The staying power of developers was greatly reduced. This time around lending has comprised a much lower percentage of development. At Related, leverage has become quite low. The ratio of our bank loans to total costs is fairly insignificant, so should there be a slow-down, we would be in a much better position to deal with any loans in any one of our jobs. The new deposit structures for preconstruction projects – we were the first to implement this – require significant cash payments up front. In the first two buildings we developed post-recession, we required down payments of 80 percent of the purchase price. Today, we as a market have settled in at 50 percent, which is still significant, considering that pre-recession this was at 20 percent. Related has also become more diversified. We have our luxury condominium projects, which are doing well, but the company is also expanding in its property management and multifamily divisions here in South Florida, as well as globally. We are engaging in more joint ventures and are continuing to acquire great sites for future developments. If the condominium market slows, the company can sustain itself. 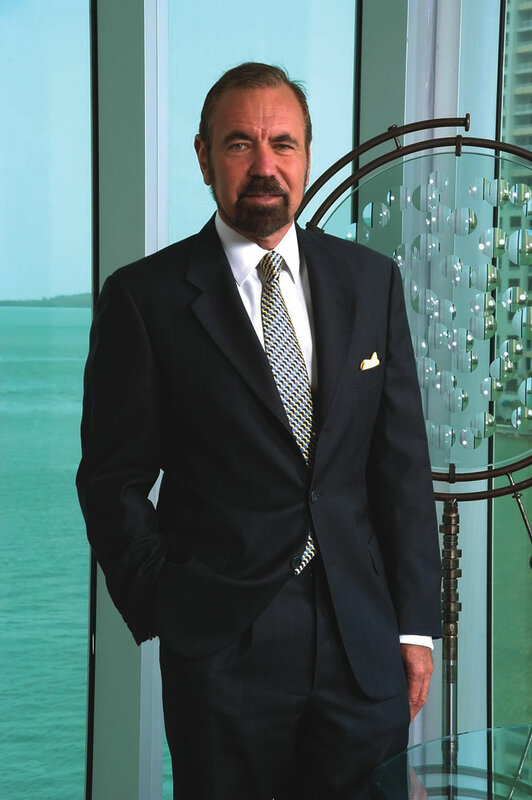 Miami developers today are more adept at handling what is called “patient money” – money in the market today that doesn’t need the short-term gains and is really there for the long-term. In terms of financing, what safeguards exist today that mitigate some of the risks in Miami real estate? The difference between today and the previous cycle is the level of financing from banks has been greatly reduced, which decreases the risk exposure of developers. Banks are lending at a much lower rate. They are more conservative and are being paid back more than in the past. They are scrutinizing the quality of the developer before they lend. On the other hand, there are more equity sources coming into Miami, making avail-able a greater diversity of funding. It is not only developers and financiers that have become more refined– the buyers and investors have too. There are 80 countries represented among the buyers of Related projects. The capital infusion from foreigners launched this market’s rebirth. These buyers are very sophisticated. They hedge themselves on their currency with the dollar constantly, so events like currency fluctuations and the strengthening U.S. dollar are less of a concern for this market than it was 20 years ago. One trending Miami neighborhood for condo development is Edgewater, where Related has big projects. What is the growth potential of this area? Edgewater, or Edgewater East, is a waterfront stretch from 20th Street up to 36th Street along Biscayne Boulevard. The geography alone speaks to area’s potential. It is bound by the Julia Tuttle Causeway to the north, the Venetian Causeway to the south, Biscayne Bay to the east, and Biscayne Boulevard to the west. The area offers incredible views, and is well-connected to downtown and the beach. This pocket was not penetrated much in the old days, so there was immense opportunity, which was why during the downturn we started purchasing distressed properties in the area from the banks. How are Related’s Edgewater projects progressing? Our Edgewater properties have seen strong demand, and progress in both construction and sales has been remarkable. In November 2014, we broke ground on Paraiso Bay, and today 99 percent of the units have been sold. ONE Paraiso is 94 percent sold, and that broke ground in December 2014. Our fourth tower, Paraiso Bay Views, is 70 percent sold, and we started closings in our first Edgewater project, Icon Bay, which is sold out. Outside of real estate, you have made significant investments in Miami’s cultural infrastructure. How do arts and culture support Miami’s growth? I think Miami’s art and culture offering have been one of the great engines for Miami’s growth. Even in the condominium projects, you are seeing how art is taking center stage – for instance, we have taken art pieces valued at $2 million to $4 million and put them in our buildings. More than anything else, events like Art Basel Miami Beach have highlighted Miami as not just a fun place, but as a cultural place, where art is an integral part of the community. Miami has become a place where art thrives. We never had that before. Art has become an important part of Miami becoming a truly great metropolis. How would you characterize Miami’s art scene? We excel in contemporary art and Latin American art. The niche for arts in Miami, like Miami itself, is that it functions as the center between the north and the south of the Americas. We are definitely not New York City – we don’t have the Metropolitan Museum of Art and the Museum of Modern Art (MoMA) like New York does – but we are striving to get there. The exhibits we’ve had at the Perez Art Museum Miami (PAMM), such as the Ai Weiwei and others featuring emerging artists, have been highly acclaimed. We have a long ways to go, and we still have to invest massively in cultural infrastructure to get to the level of a true global city. Crucial for growing the arts, and broader economic diversification, in Miami is having affordable and attainable housing. As an expert in this realm, what do you feel needs to happen to promote affordability? It’s a huge challenge. When we talk about having a 24-hour city, filled with people who live, work, play, and shop, we don’t want this to just be for the rich people, or the upper middle class; we want this to be for everybody, from artists to workers, and so forth. Unfortunately, developing in urban areas – and this is not unique to Miami – is very expensive. The majority of the population cannot afford the condominiums being built in the downtown and urban locations. This is a huge problem that cannot just be solved by the private sector. We need government programs and subsidies to allow all segments to afford housing in this global city we’re trying to create. There are innovative ways for private sector to tackle housing concerns. Although Related is active in the luxury segment, we also have a division geared towards attainable housing. In some areas we’ve created apartment buildings where rents are structured such that 80 percent is set at market rate and 20 percent is restricted to a certain portion of tenants’ income. We’ve done joint ventures with the county on rehabilitating the public housing that has been sitting out there for 40 to 50 years – and we are bringing federal tax credits in rehabilitating them. Resolving this challenge will entail a combination of both public and private sector solutions.